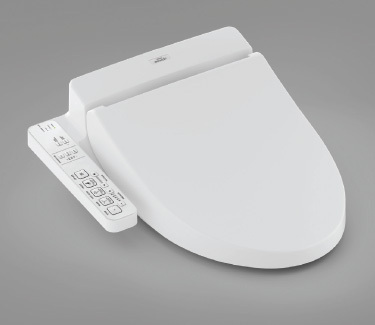 This is Jbidet.com’s own review of the Toto Washlet C100. The C100 is one of Toto’s best entry-level bidet toilet seats, and we are excited to have a deep look at the Washlet with you. For those of you who want to buy a product made by Toto without spending a fortune on some of their fantastic features and quality, the C100 certainly fits the bill. First we’re going to take a look at the design in terms of its appearance, dimensions, and built. The C100, being a more basic model, features an attached control panel that would be on your right side when seated on the toilet. On the far right of the panel, there is an LED indication light for the settings “Energy Saver”, “Seat”, “Water”, and “Power”. Next to it is the on/off button for “Wand Cleaning” and “Energy Saver”. Then there are the adjustment buttons for the temperature of the seat, water, and dryer which you can set to low, medium, or high. And finally there are buttons for “Dryer”, “Front” wash, “Rear” wash, “Soft Rear” wash, and “Stop” as well as buttons to adjust the water pressure to 5 different levels and washing position to 5 different points. While at first it may seem like a lot of buttons, the control panel is actually very clear and straightforward once you get past the learning curve and discover which settings are most comfortable to you. The C100 is available in two designs: elongated and round. It’s quite easy to distinguish what kind of toilet you have. You should be able to see what kind of toilet you have simply by looking at it. 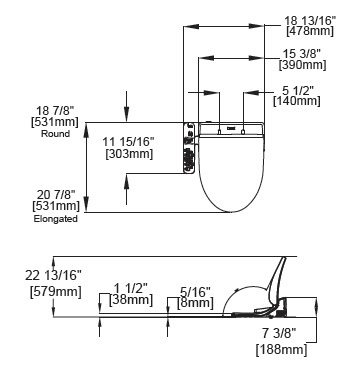 Precisely, elongated toilets are about 18.5 inches long from the mounting bolts at the back to the front, and round toilets are about 16.5 inches. Either C100 models will fit either your 1 piece toilet or 2 piece toilet. However, they may not fit your 1 piece French curve toilet, if you have one. We recommend checking with the manufacturer if you’re not sure. The elongated version of the C100 measures two inches longer than the round version. Its dimensions are 20 7/8” long, 18 13/16” wide (including the control panel on the side), and 7 3/8” at the highest point in the back. The round version is 18 7/8” long. The Toto Washlet C100 comes in Cotton white or Sedona beige. There are three dedicated cleansing buttons: Rear, Soft Rear, and Front. The Rear spray cleans your rear, the Soft Rear cleans your rear with mild water pressure, and the Front spray is a bidet for ladies. While using each of these sprays, you can turn on the oscillating feature which will move the wand back and forth to wash more thoroughly. The cleansing functions of the C100 Washlet are highly customizable. You can adjust the water pressure and washing position with the buttons located on the control panel. They can be adjusted to 5 different water pressures and 5 different positions. You can also adjust the water temperature. The minimum water temperature is 95°F/35°C and maximum water temperature is 104˚F/40˚C. Many years ago, when Toto first designed toilet seat bidets, they discovered that the ideal temperature was 38˚C, give or take 2˚C. 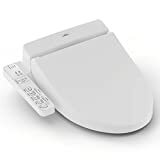 The story of how they developed the bidet toilet seat and came up with this conclusion is very interesting, so if you have a moment you can read about it here. The Toto C100 has an air dryer that is customizable as well. You can adjust its temperature from low, which is about 86°F/30°C, to high, which is about 140°F/60°C. The adjustable heated seat has a surface temperature between 82˚F/28˚C to 97˚F/36˚C. You can turn the heated seat completely off or on energy saver mode which sets the seat to about 79˚F/26˚C. The Energy Saver function is a unique feature of Toto bidet seats. This feature helps conserve energy during times when the toilet is used less frequently or rarely, such as during the night or during the day when you are not at home. The Energy Saver is a smart function. It automatically determines the periods when the toilet is used less frequently and not at all. It takes about 10 days for it to recognize your toilet habits, and it will automatically launch into energy saver mode if you have the setting turned on. During periods of infrequent use, the Toto C100 Washlet will lower the toilet seat temperature to save energy. During periods when the toilet is never used, both the heated seat and warm water heater are turned off. If someone happens to use the toilet during this time, the toilet seat heater and warm water heater will turn on, but it will take 15 minutes and 10 minutes respectively to warm up. When the Energy Saver feature is turned on the LED display light will be green. When the feature is actually in Energy Saver mode the light will be orange. Cleaning the nozzle is easy with a dedicated wand cleaning feature and button. It’s recommended to clean the nozzle monthly or when you notice dirt. Press the on/off button for wand cleaning. The wand will extend and water will be sprayed for cleaning. The wand will automatically retract after five minutes. Use a soft, wet cloth to wipe the wand. Be careful not to pull, push, or press the wand with excessive force as this can cause damage. When you’re finished you can press the on/off button again and the wand will retract. This model has a deodorizer, which is an amazing feature at this price point. The deodorizer starts as soon as you sit down. It stops two minutes after you stand up. You can turn the deodorizer on/off as you wish. But why would you turn it off? With the deodorizer you wouldn’t notice if someone did #2 right before you used the toilet! The deodorizing filter should be cleaned monthly or when you notice odors. Simply unplug the power, remove the filter carefully so not to break it, and scrub with a toothbrush. Make sure it is dry before placing it back in. Then plug the power back. The deodorizing filter is located on the right side (facing the toilet) of the toilet seat. The C100 has a pre-mist feature. The mist is sprayed inside the toilet bowl as soon as you sit down. The function of this mist is to make it more difficult for dirt to adhere. It’s a nice feature to have because you don’t have to scrub the toilet bowl as much. You can also turn the mist on/off as you like. Finally, many people ask this question: Do you need a hot water supply? The answer is no. The toilet seat heats the water. But you’ll need to plug the seat into an electric outlet. Buying a toilet seat bidet is a huge investment. After all, you’re going to be sitting on it multiple times a year for many, many years. You have to make sure that you get one that suits your needs (which is why you’re reading this, of course!). To help with your decision, we put together some reasons why the Toto C100 might be the one you’re looking for. The main thing we feel we should mention is the potential difficulty you might have when installing a toilet seat. This is especially true if you need to add an electrical outlet nearby. It would require hiring an electrician. And if the product doesn’t fit with the current setup in your bathroom, you might have to make adjustments, either by going to the plumbing store or hiring a plumber. The other small quirk is that when you have the lid down, you will notice a steep slope with the C100. It probably won’t be as flat as your old toilet seat. This is because the toilet seat needs to house all the electrical parts that make it function. The Toto C100 Washlet is jammed with features yet it is a reasonably priced product compared to many bidet toilet seats on the market. You can buy this bidet conveniently online or at your local home improvement store. Plus, you can hire a handyman through most retailers to help you with the installation.